After 4 months of hard work by engineers and scientists from France, Canada, and CFHT, and over a decade in the making, an important milestone has been reached for SPIRou, CFHT’s new planet hunting spectropolarimeter. On April 24th around 7:50 pm Hawaii time, the instrument recorded, for the first time, light coming from a star through the telescope and the various fiber-linked SPIRou components. During the following few nights, SPIRou gathered an impressive collection of about 440 spectra of 24 stars, while demonstrating a few of its unique capabilities in the process. SPIRou (SpectroPolarimètre InfraRouge) is a high resolution spectropolarimeter and a high precision velocimeter optimized for discovering Earth twins orbiting in the habitable zone of nearby red dwarf stars and exploring fledgling stars and their planetary systems in the making. Before coming to CFHT, the instrument was integrated and intensively tested at L’Institut de Recherche en Astrophysique et Planétologie (CNRS/Université Paul Sabatier) and the Services Communs de l’Observatoire Midi Pyrénées (CNRS/UPS/IRD/CNES/MétéoFrance), Toulouse,France; after demonstrating its performances through in-lab testing, SPIRou was disassembled, packed, shipped and reassembled at CFHT. The components of the spectrograph were repositioned on the instrument’s optical bench to a precision better than the width of a human hair. During this first on-sky exercise, SPIRou observed stars cooler than the Sun known as red dwarfs, a stellar population comprising most of the stars in the neighborhood of our Solar System. An upcoming large program using SPIRou will closely observe nearby red dwarfs looking for evidence of nearby planetary systems. 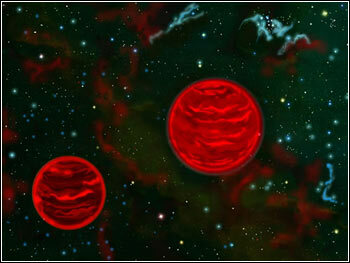 The first star observed with SPIRou was AD Leonis, a very active red dwarf located 16 light years from Earth in the constellation of Leo. AD Leonis is known for its strong magnetic fields and hugely energetic flares. “AD Leonis is very famous for being an active star with large radial velocity variations and a known magnetic field. That makes it a perfect target for the first SPIRou observations. We’re observing AD Leonis to determine if the data we observe with SPIRou matches the known results on the star” explains Claire Moutou, astronomer and SPIRou instrument scientist at CFHT. SPIRou indeed demonstrated its ability at detecting the magnetic field of AD Leonis. SPIRou also observed hot stars known as “telluric standards”, stars whose spectra contain mostly telluric lines from the Earth’s atmosphere. As an infrared instrument, SPIRou is particularly affected by telluric lines. Identifying the telluric spectrum is essential to determine which features of SPIRou’s spectra are from the observed stars and which come from the Earth’s atmosphere. The distinction is critical in revealing the presence of orbiting planets. After being delivered at CFHT in January, SPIRou was installed at its new home location on the third floor of CFHT, and reassembled by engineers and specialists from SPIRou partners namely IRAP (CNRS/UPS), Institut de planétologie et d’astrophysique de Grenoble (CNRS/Université Grenoble Alpes), Laboratoire d’astrophysique de Marseille (CNRS/CNES/AIx-Marseille Université), Institut d’Astrophysique de Paris (CNRS/Sorbonne Université), National Research Council Herzberg (Victoria, Canada), Observatoire du Mont-Mégantic (OMM), Université de Montréal (Montreal, Canada), with invaluable support from the whole CFHT team. The instrument was then cooled down for the first time at CFHT to verify alignment of the optical components and conduct engineering tests. Cryocooled to a temperature of 200°C below freezing, SPIRou is thermally stabilized to a level a thousandth of a °C to be able to detect the tiny signatures that planet encode in the light from their host stars. 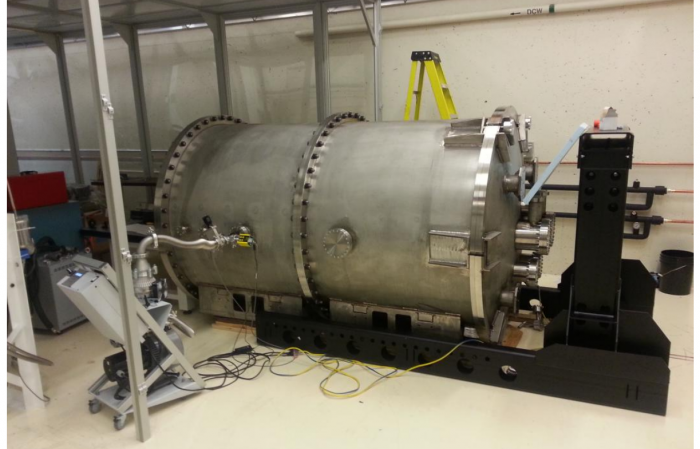 The instrument was then warmed up to implement its brand-new science-grade 4kx4k detector from TIS, following its detailed characterization by the OMM and Université de Montréal teams, and to refine the alignment, before being cooled down again for a new testing session. The detector, a Hawaii 4RG or H4RG was fabricated by Teledyne, tested and assembled at the Université de Montréal before being shipped to CFHT. The H4RG is a new kind of infrared device that will greatly enhance the capabilities of SPIRou. The H4RG has 4k x4k 15 micron pixels which will be read out continuously to avoid increasing the detector’s temperature. Preliminary tests show that the detector is of excellent quality. “SPIRou is a unique and very powerful instrument. At the Institute for research on exoplanets, we are all very excited about the fact that it will find the closest habitable worlds from the Earth, the ones we will be able to study in more details with the James Webb Space Telescope.” says Rene Doyon, SPIRou co-PI at Université de Montréal, director of iREx and OMM. SPIRou was designed, funded and constructed thanks to a worldwide consortium of laboratories and institutes, namely IRAP (CNRS/UPS), Services communs de l’Observatoire Midi-Pyrénées (CNRS/UPS/IRD/CNES/MétéoFrance), Observatoire de Haute-Provence, Institut de planétologie et d’astrophysique de Grenoble (CNRS/Université Grenoble Alpes), Laboratoire d’astrophysique de Marseille (CNRS/CNES/AIx-Marseille Université), Institut d’Astrophysique de Paris (CNRS/Sorbonne Université) and CFHT. See the U Hawaii press release here . 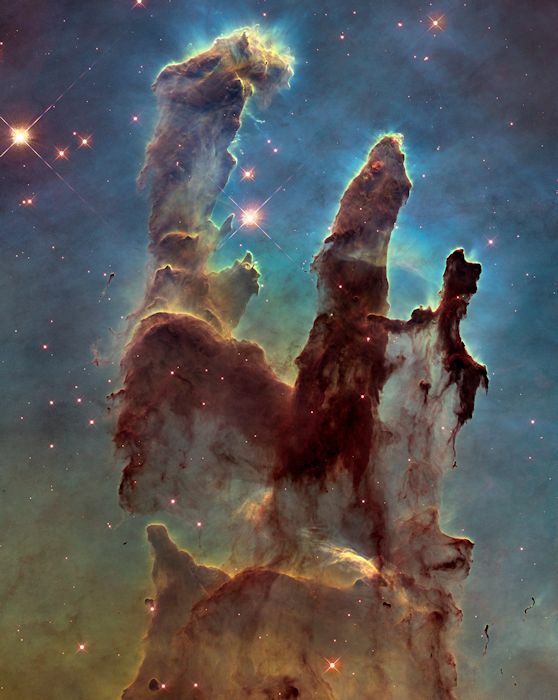 While this image is spectacular, there are actually stars that Hubble can’t see inside those pillars of dust. And that’s because the visible light emitted by those stars is being obscured by the dust. 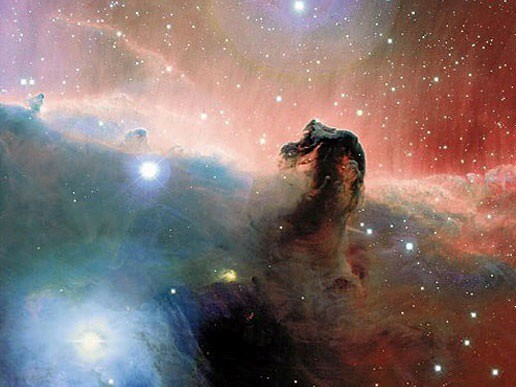 But what if we used a telescope sensitive to infrared light to look at this nebula? 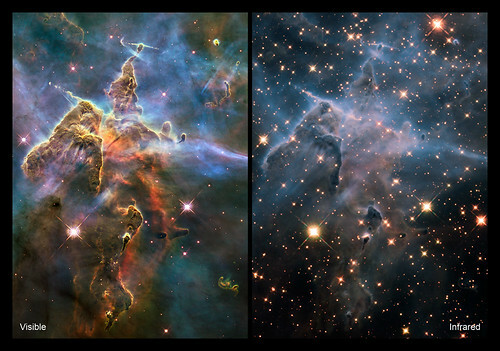 Another nebula, the “Mystic Mountains” of the Carina Nebula, shown in two Hubble images, one in visible light (left) and one in infrared (right). 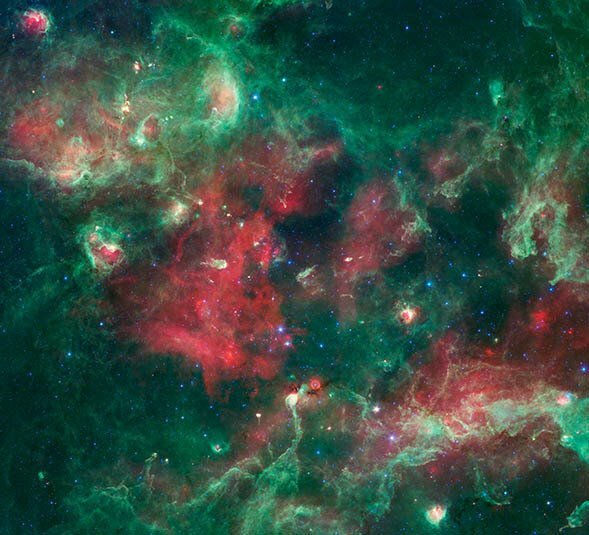 In the infrared image, we can see more stars that just weren’t visible before. Why is this? We can try a thought experiment. What if you were to put your arm into a garbage bag? Your arm is hidden. Invisible. But what if you looked at your arm and the garbage bag with an infrared camera? Remember that infrared light is essentially heat. And that while your eyes may not be able to pick up the warmth of your arm underneath the cooler plastic of the bag, an infrared camera can. An infrared camera can see right through the bag! JWST’s amazing imaging and spectroscopy capabilities will allow us to study stars as they are forming in their dusty cocoons. Additionally, it will be able to image disks of heated material around these young stars, which can indicate the beginnings of planetary systems, and study organic molecules that are important for life to develop. How do clouds of gas and dust collapse to form stars? Why do most stars form in groups? Exactly how do planetary systems form? How do stars evolve and release the heavy elements they produce back into space for recycling into new generations of stars and planets? To unravel the birth and early evolution of stars and planets, we need to be able to peer into the hearts of dense and dusty cloud cores where star formation begins. These regions cannot be observed at visible light wavelengths as the dust would make such regions opaque and must be observed at infrared wavelengths. Stars, like our Sun, can be thought of as “basic particles” of the Universe, just as atoms are “basic particles” of matter. Groups of stars make up galaxies, while planets and ultimately life arise around stars. Although stars have been the main topic of astronomy for thousands of years, we have begun to understand them in detail only in recent times through the advent of powerful telescopes and computers. A hundred years ago, scientists did not know that stars are powered by nuclear fusion, and 50 years ago they did not know that stars are continually forming in the Universe. Researchers still do not know the details of how clouds of gas and dust collapse to form stars, or why most stars form in groups, or exactly how planetary systems form. Young stars within a star-forming region interact with each other in complex ways. The details of how they evolve and release the heavy elements they produce back into space for recycling into new generations of stars and planets remains to be determined through a combination of observation and theory. 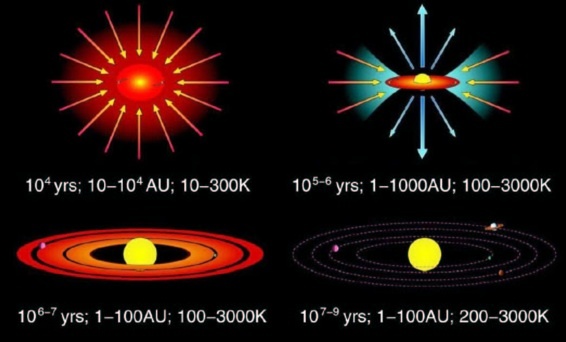 The stages of solar system formation are illustrated to the right: starting with a protostar embedded in a gas cloud (upper left of diagram), to an early star with a circumstellar disk (upper right), to a star surrounded by small “planetesimals” which are starting to clump together (lower left) to a solar system like ours today. The continual discovery of new and unusual planetary systems has made scientists re-think their ideas and theories about how planets are formed. 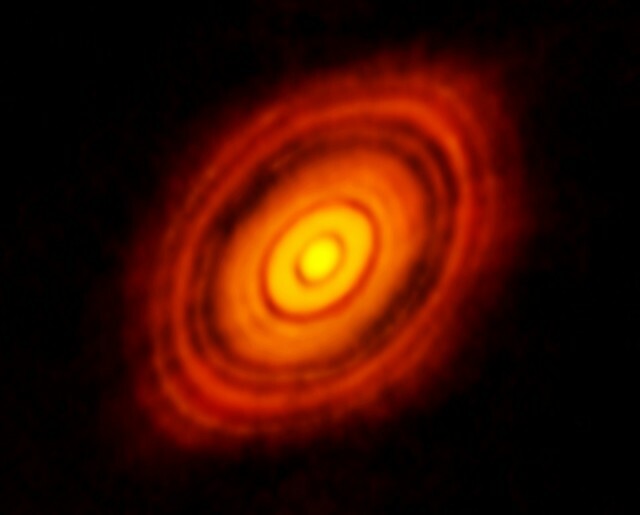 Scientists realize that to get a better understanding of how planets form, they need to have more observations of planets around young stars, and more observations of leftover debris around stars, which can come together and form planets. This video shows how JWST will peer inside dusty knots where the youngest stars and planets are forming. Laboratoire d’Astrophysique de Marseille (AMU, CNRS). In a publication recently accepted in Astronomy and Astrophysics, an international team involving French researchers from the Laboratoire d’Astrophysique de Marseille and Canadian researchers from NRC Herzberg and Queens University have studied Malin 1, a nearby galaxy that has been known only since the eighty’s and that shows an extremely large disk of gas and stars. The new observations of Malin 1, a prototype of the class of “giant low surface brightness galaxies” allowed the team to obtain new results in contradiction with one of the hypotheses concerning the formation of this type of galaxies. An international team led by researchers from the Laboratoire d’Astrophysique de Marseille (LAM) has used MegaCam on CFHT to observe NGC 4569, the most massive spiral galaxy in the Virgo cluster. They observed, for the first time, spectacular tails of ionized gas that extend for over 300,000 light years, five times larger than NGC 4569 itself! This observation confirms that ram pressure stripping due to the intracluster medium is depriving NGC 4569 of its gas reservoir. This important constraint must be taken into account in any cosmological model striving to incorporate the effect of environment on the evolution of galaxies. The result also shows that MegaCam at CFHT is now a second-to-none world-class facility to study gas stripping and opens up a promising new avenue for understanding the role of environment in the evolution of galaxies. 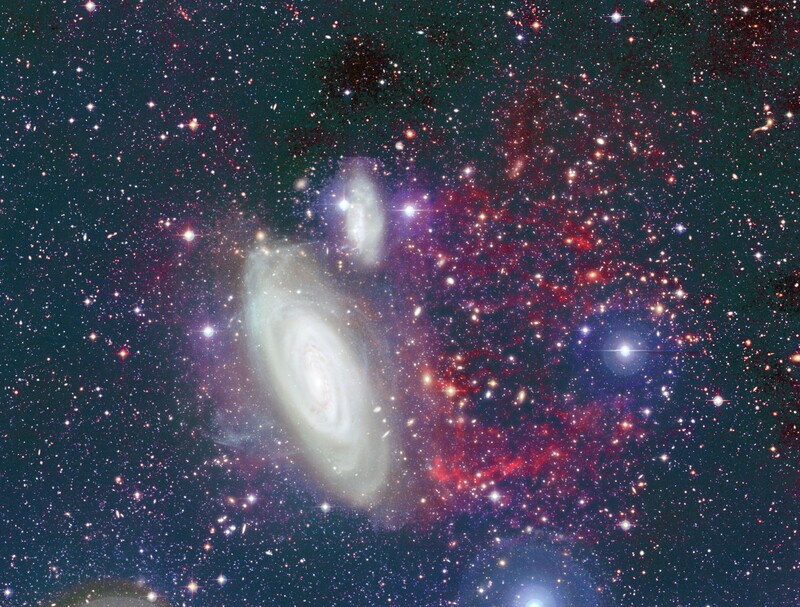 The colour image of the galaxy NGC 4569 in the Virgo cluster, obtained with MegaCam at the CFHT. The red filaments at the right of the galaxy show the ionised gas removed by ram pressure. This is about 95% of the gas reservoir of the galaxy needed to feed the formation of new stars (image ©2015 CFHT/Coelum). Galaxies are not distributed uniformly throughout the universe. Some are found in dense clusters that can contain hundred to thousands of galaxies. Astrophysicists suspect that living in a cluster environment can have a strong influence in the way galaxies evolve. The tell-tail signs have long been recognized: for instance, compared to less dense regions, clusters contain proportionally more elliptical galaxies (spheroidal systems with little to no gas and dust) and fewer spirals (gas rich disky systems in which new stars are continuously formed from the gas in the interstellar medium). And even the few spiral galaxies found in clusters generally contain less gas and have an older population of stars than isolated spiral galaxies. Several mechanisms have been proposed to explain the difference observed between galaxies in different environments. First, when two galaxies interact, tidal forces tend to rip apart and disrupt the outermost, less gravitationally bound and most diffuse parts. A second mechanism is the “dynamical pressure” exerted on the interstellar medium of a galaxy as it travels through the hot, diffuse medium that permeates the space in between galaxies, a process known as `ram pressure stripping’ (a biker travelling at high speed would experience a similar kind of pressure from the ambient air!). These two processes are able to lift gas from the disks of spiral galaxies, and therefore inhibit the formation of new stars. There is also a third mechanism that is thought to affect mostly the most massive galaxies: these galaxies host very massive black holes at their centres, and the energy liberated by the accretion onto these black holes, injected into the surrounding medium, can unbind the gas. Identifying which of these processes is dominant is critical to constrain cosmological simulations that follow the evolution of galaxies. Observationally, however, observing the low density gas as it is being stripped is a tremendous challenge. 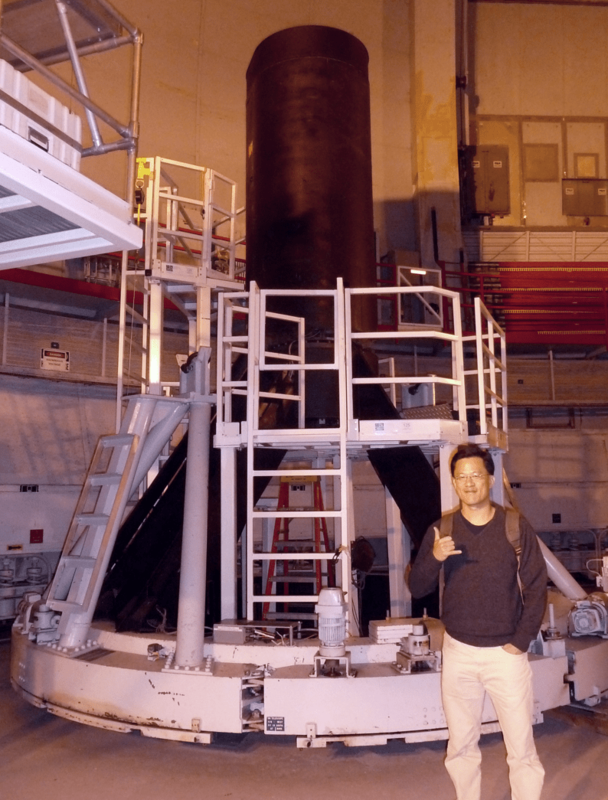 The MegaCam Camera on the Canada France Hawaii Telescope (CFHT) has recently been equipped with a new, high efficient narrow-band filter that isolates the H-alpha emission line from the ionized gas, allowing it to be detected with high efficiency. An international team led by researchers from the Laboratoire d’Astrophysique de Marseille (LAM) has used this instrument to observe NGC 4569, the most massive spiral galaxy in the Virgo cluster (at 45 million light years, the massive cluster of galaxies closest to the Milky Way). The Virgo cluster is still evolving, and therefore offers the opportunity to observe the transformation of galaxies as it takes place. NGC 4569 is moving through the cluster at a staggering 1200 km/s. The H-alpha image obtained with MegaCam at CFHT shows for the first time spectacular tails of ionized gas that extend for over 300,000 light years, five times larger than NGC 4569 itself ! This observation confirms that ram pressure stripping due to the intracluster medium is depriving NGC 4569 of its gas reservoir. An estimate of the mass of gas in these tails shows that 95% of the interstellar medium has already been removed from the disk of the galaxy, greatly limiting its ability to form new stars. For a galaxy as massive as NGC 4569, it is perhaps surprising that internal gravitational forces are not strong enough to hold the gas together, counteracting the action of ram pressure stripping. Indeed, in cosmological models, it is hypothesised that in such massive galaxies, it is the activity related to the central supermassive black hole to cause the gas to be lost. The new observations show instead that the dominant effect is ram pressure: this important constraint must be taken into account in any cosmological model striving to incorporate the effect of environment on the evolution of galaxies. The result also shows that MegaCam at CFHT is now a second-to-none world-class facility to study gas stripping and opens up a promising new avenue for understanding the role of environment in the evolution of galaxies. By combining multi-wavelength data obtained from space with Planck and WISE, and from the ground with MegaCam on CFHT, a team of researchers has revealed the structure of the diffuse interstellar medium over several square degrees with unprecedented details. In particular, this study reveals the statistical properties of interstellar turbulence over a wide range of scales, from 0.01 to 10 pc. Optical images in true colours of the cirrus field obtained with MegaCam on the CFHT. Image credits: MATLAS collaboration, Pierre-Alain Duc. The main innovation of this work is the use of a large optical telescope (the CFHT) to study the structure of the interstellar medium at high resolution and on a large area on the sky, something that is very challenging to obtain with more classical observations done in the infrared. This mapping of these interstellar cirrus clouds located within a few hundred parsec from the Sun can be done because interstellar dust grains scatter starlight. This scattered light has been detected for decades by optical telescopes. Here it is the first time that is exploited scientifically to study the structure of interstellar clouds which is composed of faint filamentary structures of various sizes. 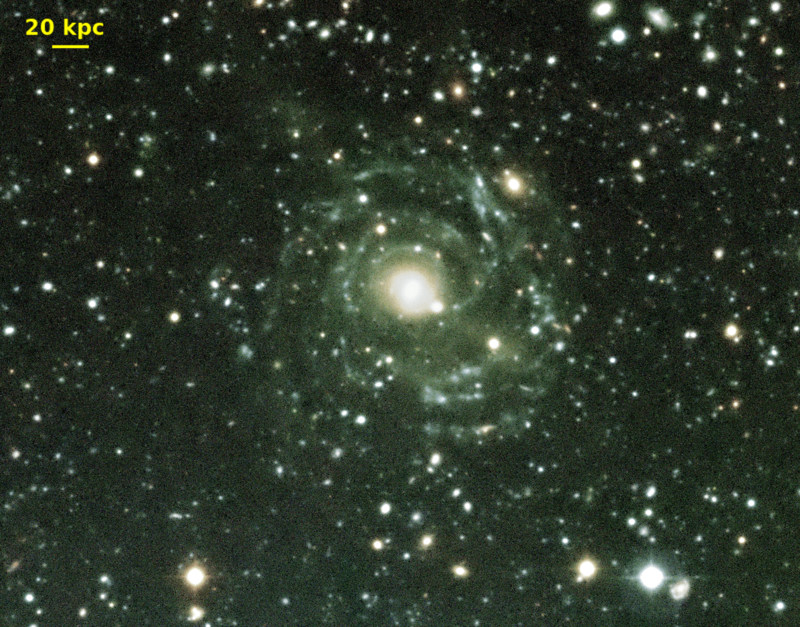 The result obtained benefit from specific image processing and data acquisition techniques developed in the context of the MATLAS Large Program at CFHT that aims at detecting faint diffuse emission around galaxies. Combined power spectrum : black is Planck radiance, red is WISE and blue is MegaCam. The units of the y axis are arbitrary; each power spectrum was scaled in order to match the others. For each power spectrum, we show data points corresponding to scales larger than the beam and where the power is above the noise component. The data points shown here are noise subtracted and divided by the beam function. The best fit gives P(k) ~ k^(2.9±0.1). Figure from Miville-Deschênes et al. 2016. One advantage of the high angular resolution provided by the CFHT data is to eventually reach the angular scale at which turbulent energy dissipates. Understanding the exact process by which kinetic energy is dissipated and heats gas is essential. 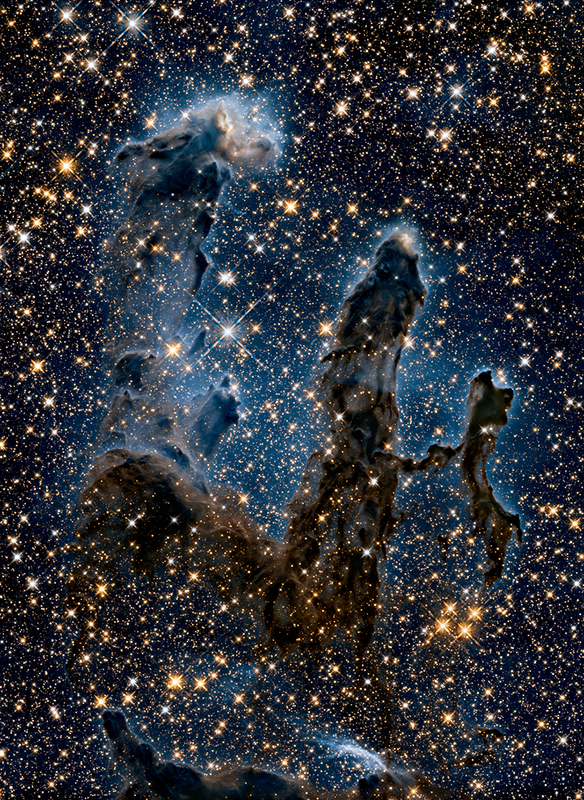 It is key in the formation of dense structures that lead to the formation of stars. For instance, recent studies based on Herschel observations of molecular clouds have revealed the presence of filaments with widths of 0.1 pc that seem constant whatever their mass. This observational fact has been attributed to the energy dissipation process, namely ambipolar diffusion (friction between neutrals and ions). 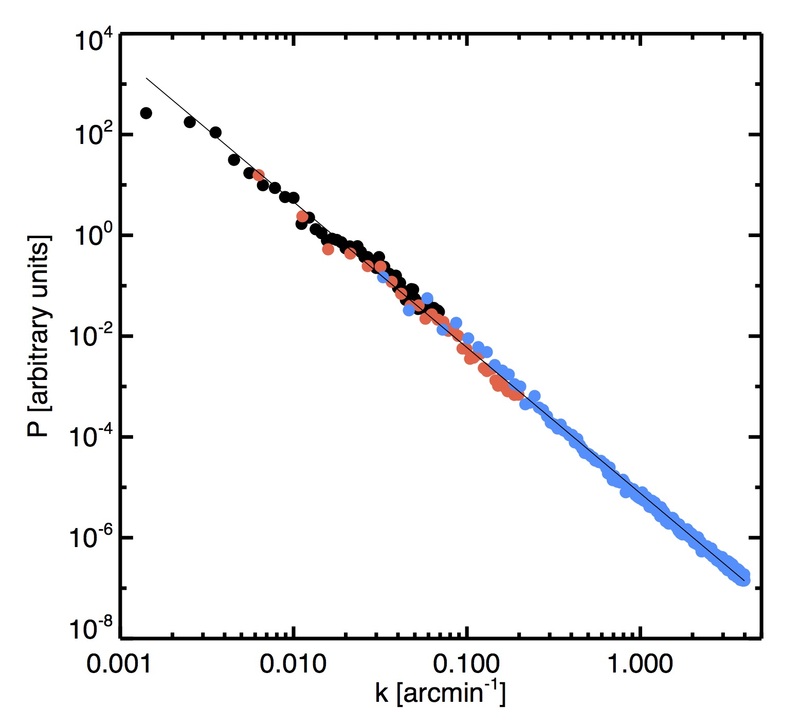 The present study shows that the dissipation scale in the interstellar medium is smaller than 0.01 pc which brings important constraints on the exact process resposible for this dissipation. These results emphasize the fact that scattered light from cirrus, an important source of pollution for deep imaging destined to mapping diffuse structures around massive galaxies, is carrying potentially precious information about the nature of the physical processes involved in the evolution of matter in our own galaxy. 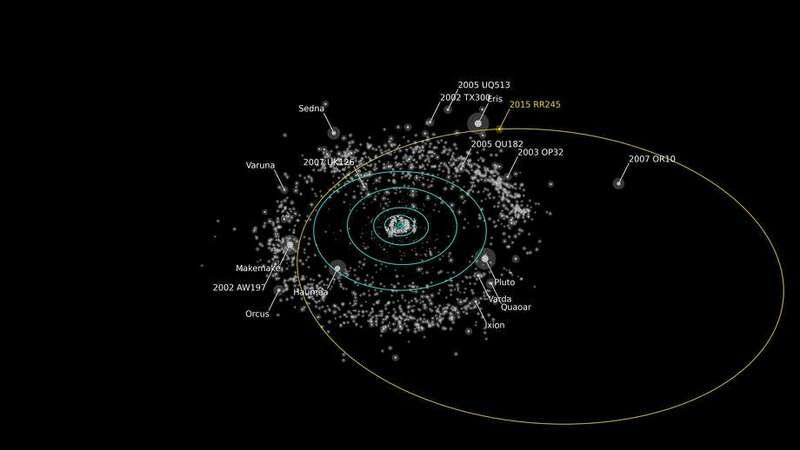 An international team of astronomers have discovered a new dwarf planet orbiting in the disk of small icy worlds beyond Neptune. The new object is roughly 700 kilometers in size and has one of the largest orbits for a dwarf planet. Designated 2015 RR245 by the International Astronomical Union’s Minor Planet Center, it was found using the Canada-France-Hawaii Telescope on Maunakea, Hawaii, as part of the ongoing Outer Solar System Origins Survey (OSSOS). Discovery images of RR245. The images show RR245’s slow motion across the sky over three hours. Credit OSSOS team. “The icy worlds beyond Neptune trace how the giant planets formed and then moved out from the Sun. They let us piece together the history of our Solar System. But almost all of these icy worlds are painfully small and faint: it’s really exciting to find one that’s large and bright enough that we can study it in detail.” said Dr Michele Bannister of the University of Victoria in British Columbia, who is a postdoctoral fellow with the Survey. National Research Council of Canada’s Dr JJ Kavelaars first sighted RR245 in February 2016 in the OSSOS images from September 2015.”There it was on the screen— this dot of light moving so slowly that it had to be at least twice as far as Neptune from the Sun.” said Bannister. The team became even more excited when they realized that the object’s orbit takes it more than 120 times further from the Sun than Earth. The size of RR245 is not yet exactly known, as its surface properties need further measurement. “It’s either small and shiny, or large and dull.” said Bannister. The vast majority of the dwarf planets like RR245 were destroyed or thrown from the Solar System in the chaos that ensued as the giant planets moved out to their present positions: RR245 is one of the few dwarf planets that has survived to the present day — along with Pluto and Eris, the largest known dwarf planets. RR245 now circles the Sun among the remnant population of tens of thousands of much smaller trans-Neptunian worlds, most of which orbit’s is unseen. “OSSOS was designed to map the orbital structure of the outer Solar System to decipher its history.” said Prof. Brett Gladman of the University of British Columbia in Vancouver. “While not designed to efficiently detect dwarf planets, we’re delighted to have found one on such an interesting orbit”. RR245 is the largest discovery and the only dwarf planet found by OSSOS, which has discovered more than five hundred new trans-Neptunian objects. 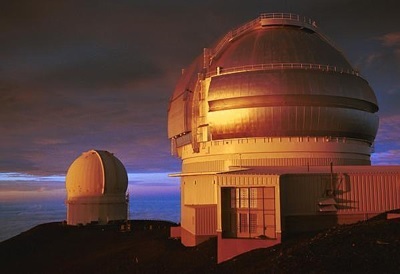 “OSSOS is only possible due to the exceptional observing capabilities of the Canada-France-Hawaii Telescope. CFHT is located at one of the best optical observing locations on Earth, is equipped with an enormous wide-field imager, and can quickly adapt its observing each night to new discoveries we make. This facility is truly world leading.” said Gladman. OSSOS is based on observations obtained with MegaPrime/MegaCam, a joint project of the Canada-France-Hawaii Telescope (CFHT) and CEA/DAPNIA, and on data produced and hosted at the Canadian Astronomy Data Centre. CFHT is operated by the National Research Council of Canada, the Institute National des Sciences de l’Universe of the Centre National de la Recherche Scientifique of France, and the University of Hawaii, with OSSOS receiving additional access due to contributions from the Institute of Astronomy and Astrophysics, Academia Sinica, Taiwan. A team of astronomers reports the discovery of one of the very weakest magnetic fields ever securely detected in a white dwarf. The observation was made using the ISIS spectropolarimeter on the William Herschel Telescope (WHT), in just one hour of exposure time and using the red and the blue arms of the spectrograph. 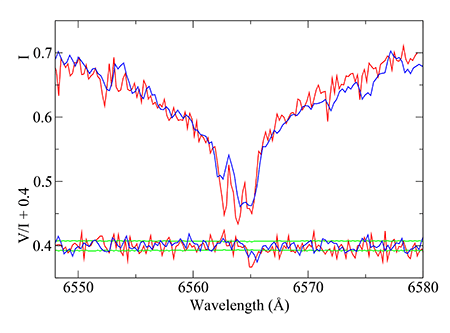 This is part of a large survey of bright white dwarfs to search for such weak magnetic fields. First observation of Zeeman splitting in the core of Hydrogen alpha due to a field of about 60 kilogauss in WD2047+372. The ISIS observation is in blue, the ESPaDOnS observation (at higher resolving power) is shown in red. The circular polarisation spectrum is shown below the intensity profile, shifted up by +0.4 to facilitate comparison with the spectral line profile. The green lines bracketing the circular polarisation are ± one sigma. Figure extracted from Landstreet et al. (2016). The strength of the magnetic field found in LTT 16093 = WD2047+372 is only about 60 kilogauss (6 teslas), 2 or 3 orders of magnitude smaller than the typical fields of tens of megagauss found in a few percent of white dwarfs. The field was marginally detected in polarimetery, but clear Zeeman splitting into a triplet was present in the sharp core of Hydrogen alpha. This first detection using ISIS was confirmed by a spectropolarimetric observation a month later with the higher resolving power spectropolarimeter ESPaDOnS on the Canada-France-Hawaii Telescope [CFHT]. It is not yet understood how the magnetic fields of white dwarfs are formed, or how they evolve during white dwarf cooling. In spite of many detections of megagauss fields in white dwarfs, mostly very faint, little is known about the low-field regime, and very little modelling of the fields of individual white dwarfs is available. This current ISIS survey is intended to increase the very small sample and to provide data for detailed modelling, and ultimately to provide data to constrain field formation scenarios. It is found that ISIS is a very powerful tool for searches for such weak fields; it is able to detect fields of tens of kilogauss using either Hydrogen-alpha spectroscopy or spectropolarimetry of Hydrogen or Helium line wings, or both, in white dwarfs fainter than V = 15. J. D. Landstreet, S. Bagnulo, A. Martin, and G. Valyavin, 2016, Discovery of an extremely weak magnetic field in the white dwarf LTT 16093 WD2047+372, A&A, 591, A80 [ADS ]. By combining multi-wavelength data obtained from space with Planck and WISE, and from the ground with MegaCam on the CFHT, a team of researchers has revealed the structure of the diffuse interstellar medium over several square degrees with unprecedented details. In particular, this study reveals the statistical properties of interstellar turbulence over a wide range of scales, from 0.01 to 10 pc. 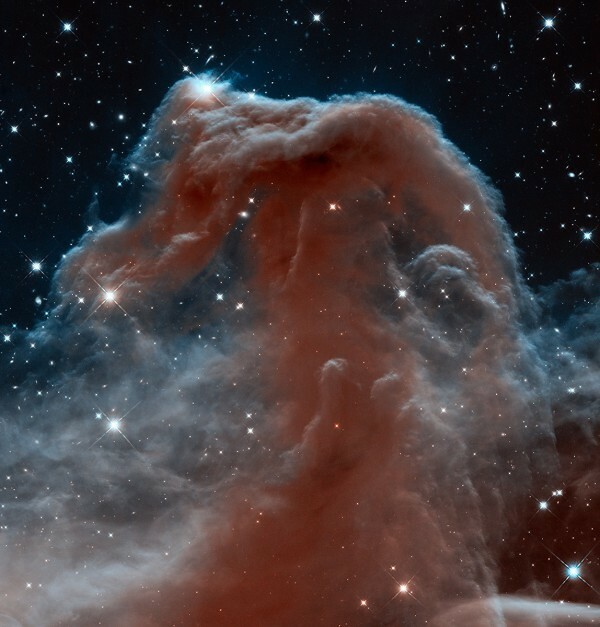 The main innovation of this work is the use of a large optical telescope (the CHFT) to study the structure of the interstellar medium at high resolution and on a large area on the sky, something that is very challenging to obtain with more classical observations done in the infrared. This mapping of these interstellar cirrus clouds located within a few hundred parsec from the Sun can be done because interstellar dust grains scatter starlight. This scattered light has been detected for decades by optical telescopes. Here it is the first time that is exploited scientifically to study the structure of interstellar clouds which is composed of faint filametary structures of various sizes. 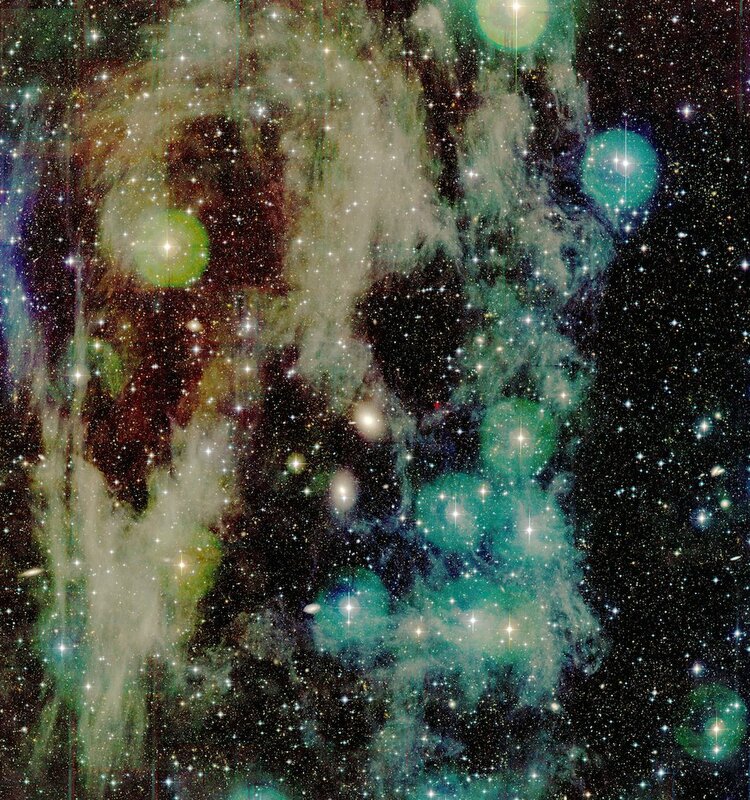 The result obtained benefit from specific image processing and data acquisition techniques developped in the context of the MATLAS Large Program of the CHFT that aims at detecting faint diffuse emission around galaxies. One advantage of the high angular resolution provided by the CFHT data is to eventually reach the angular scale at whcih turbulent energy dissipates. Understanding the exact process by which kinetic energy is dissipated and heat the gas is essential as it is key in the formation of dense structures that lead to the formation of stars. For instance, recent studies based on Herschel observations of molecular clouds have revealed the presence of filaments with width of 0.1 pc that seem constant whatever their mass. This observational fact has been attributed to the energy dissipation process, namely the ambipolar diffusion (friction between neutrals and ions). The present study is showing that the dissipation scale in the interstellar medium is smaller than 0.01 pc which brings important constraints on the exact process resposible for this dissipation. These results are emphasizing the fact that scattered light from cirrus, an important source of pollution for deep imaging destined to mapping diffuse structures around massive galaxies, is carrying potentially precious information about the nature of the physical processes involved in the evolution of matter in our own galaxy.